In 2015, we were shortlisted for national search marketing awards in the USA, the UK, and in Germany. This was already a huge success for us, because every jury focuses on specific aspects, but all of them held Trisolute News Dashboard to be a special and good software. In the US, we were even shortlisted for “Innovation”. Now we took it to the next level. 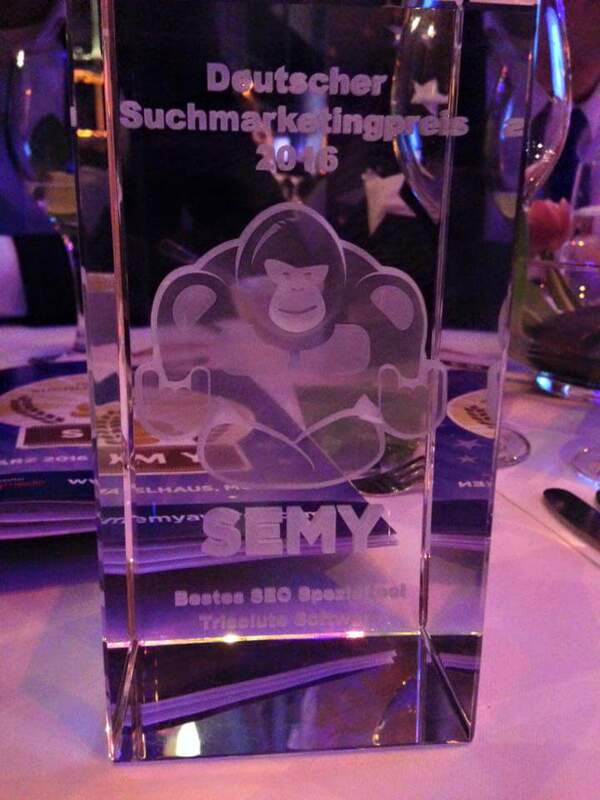 We won the German Search Marketing Award , SEMY 2016 for the best SEO special tool in the course of SMXMunich. We are really proud! We are also proud of the jury’s explanation, in which Jens Fauldrath stated: “The Trisolute News Dashboard is a unique solution for online publishers”. We are pleased that our efforts and solutions to support online publishers in their Google News optimisation are perceived so well by SEO experts in different countries. Furthermore, we received very positive feedback for the award by our German customers. This makes us extremely happy! We would also like to thank all our customers, because only with you we were able to develop the Trisolute News Dashboard as far as it is today. At the same time, we take this as a motivator to keep on working on the Trisolute News Dashboard fast and systematically. At the moment, topics that are news-relevant develop fast in the mobile SERP (e.g. News Carousel, AMP), and we are already working on solutions in the Trisolute News Dashboard in order to support the publishers’ analyses and optimisation in the seven countries that are already covered by the News Dashboard including the USA and UK. Our main goal is to satisfy our customers all over the world. If we meet this goal, we will surely be found on other shortlists, and we will also win again!